SPOILER WARNING: If you are not caught up on the featured series, read on at your own risk! Since its first episode Breaking Bad has pushed the envelope and provided an experience unlike any other series on television. With the decision to make Season 5 the last, the show was challenged with wrapping up a lot of loose ends while keeping the intensity of the previous seasons; and in 2012 Breaking Bad did just that while still leaving us wondering how things will conclude next year. With a stellar cast led by the amazing Bryan Cranston, Breaking Bad proved this year that it remains one of the best dramas around. Walter White, once an unlikely drug lord, has become more lost in the world in which he has trapped himself, while Jesse, once pegged as a hopeless case has come into his own. Over time the reversal in roles, the unusual friendship between the two and their loyalty to each other in spite of the odds against them has been the backbone of the story, and 2012 has brought that strange relationship to a head. Walter White’s character has been a study in how a once-good person can be led down a dangerous and destructive path, and the show has never shied away from the reality of his transformation. 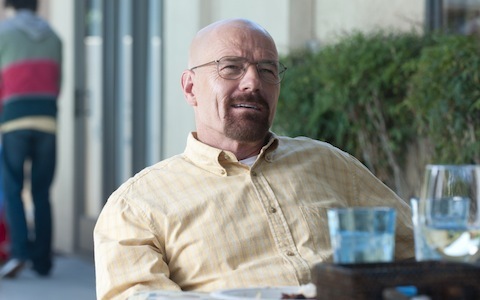 With the second half of Season 5 yet to come in 2013, Breaking Bad has left fans on the edge of our seats as usual, waiting to find out what Walt will do when confronted with his secret. It’s also left us with one of the best dramas of 2012. Parenthood is the most stressful show on television. 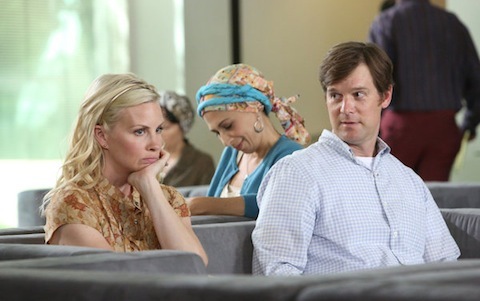 Between Kristina’s cancer treatments, Sarah’s consistently terrible decision making and all the other struggles the members of the Braverman family find themselves confronting on a regular basis, it’s often an excruciating hour to get through, but in a way, that’s actually high praise. We emotionally invest because we care, and we care because the Bravermans are collectively the most carefully written, fully fleshed out and painfully familiar large family on television. Their low points might be traumatic to get through, but all that muck makes their successes feel even more joyful. Since the show’s premiere in 2010, Jason Katims and his team of writers have been adding layers to each and every character. For the first two seasons, this process occasionally felt a bit overwhelming, but now that personalities have been long-established and the dynamics between all of the Bravermans have been explored, the show is able to convey so many emotions using just looks and brief interactions. With the additions of Victor, Hank and to a lesser extent, Ryan and Amy, 2012 has brought wonderful new faces to the table and used these people, along with story lines such as Kristina’s cancer, Crosby and Adam’s new studio and Joel’s new job, to push the people we know in exciting new directions. Here’s to hoping this gem stays around long enough to get the award show love it deserves. It aired a long time ago but it’s hard to forget Series 2 of the BBC’s adaptation of Sherlock. 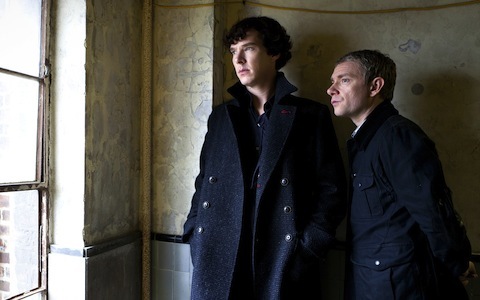 It was a great New Years Day for UK audiences as they got to enjoy the beginning of 2012 with a brand new batch of Benedict Cumberbatch and Martin Freeman solving crimes with incredibly chemistry in the reimagining of Sir Arthur Conan Doyle’s iconic deducer and his doctor and, uh, blogger companion. For those of us stateside, well, the four full months waiting for PBS’s Masterpiece Mystery! to air the second season of the modern day Sherlock Holmes and Dr. Watson stories was pure agony. Why? Because, like so many, we had seen the first season of the British series and couldn’t wait to see more of Stephen Moffat and Mark Gatiss’ had in store for the characters. Oh, and how they were going to resolve that bloody cliffhanger with Andrew Scott’s memorable Moriarty. All we were hoping for heading into Series 2 was something that came even close to the brilliance that came before it and the cast and crew behind Sherlock didn’t disappoint. Structured the same as the first season - three 90 minute installments, basically movies - the second oddly suffered from the same bit of second episode-itis (sorry, “Banker” and “Baskerville”) but the first and the last were so damn good that they had to be included. “A Scandal in Belgravia,” featuring Lara Pulver as Irene Adler, would probably rank highly among the films of the year if Paul McGuigan’s ‘Sherlocked’ adventure played on the big-screen. The third installment, “The Reichenbach Fall,” wasn’t just great immaculately plotted television but the way that the creators also kept mum on whether or not the series would continue (not to mention that it was based on “The Final Problem,” hint, hint...) raised the stakes and made it even more suspenseful. Despite a fantastic starting premise, USA’s Suits got off to a tough start when the series first aired two years ago, becoming a show that landed somewhere in the middle of the pack of new and returning shows. 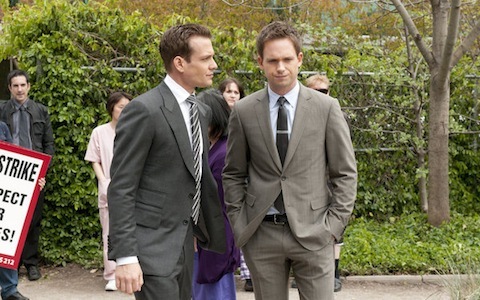 However, in Season 2, Suits returned strong, and boldly began answering the question, “What might happen should Mike’s (Patrick J. Adams) secret be found out?” While Season 2 of Suits plays out with an ensemble cast of characters, Mike’s eidetic memory and his secret life as a lawyer who hasn’t passed the bar often takes on some Dexter-like complications, but with more quick wit and whole lot less blood. Letting partner Jessica in on preserving Mike’s secret added a nice balance to the plot. Speaking of complicated, Season 2 tried to branch out a little further from it’s initial run, creating new cases and extra plotlines that spanned over multiple episodes, thus rewarding all the eager fans who tuned in each week. New characters were capably introduced and also gave the cast an added edge in terms of featuring a sort-of “villain” in the office. In short, there were a lot of great additions to the show that amped up it’s game and made the series a major player in 2012. With a likeable cast and a continually revolving format, Suits has become a stronger player in the TV realm,and viewers should expect more great moments from the program when 2013 rolls around. Recent seasons of Dexter haven't quite lived up to the series' earlier seasons. But Season 7 brought the Showtime drama back to greatness by returning the primary focus to the lead character and wrapping up some of the additional story arcs early on, leaving those last free of clutter and at the same time, packed with suspense and drama. 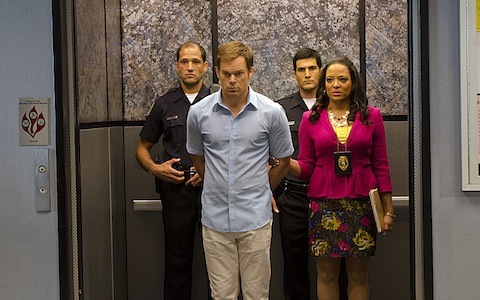 Season 7's pacing is a big part of why Dexter ranks up there with some of the best TV had to offer this year. From the start of the season, the suspense began building, with LaGuerta's investigation almost buried behind other issues, including Deb's anxiety as she tried to understand and accept her brother's dark passenger. Also introduced was the death of one of MIami Metro Homicide's own, which eventually led to Dexter getting mixed up with a Ukrainian criminal on a mission for vengeance. And then there was Dexter's developing romance with Hannah. These arcs played out and just as some of them began to wrap up, LaGuerta's growing suspicion of Dexter turned to accusation. She went full-on Doakes with him, putting her own career in jeopardy and coming dangerously close to proving Dexter was the Bay Harbor Butcher. The final episode of the season proved to be one of the more stressful pieces of scripted television this year, for all of the right reasons. The show set itself up to leave us guessing and unable to fully predict just how things would turn out. In the end, we were left with yet another brilliant game changer in the final moments of the season, as one character redefined themselves with the pull of a trigger. Last spring, the CW’s southern drama, Hart of Dixie set up several complicated love triangles that either needed to be broken up or expanded as the fall rolled around. It’s those initial love triangles that sucked many fans in, but by the end of the first few episodes this fall, more inter-town romances and partner swapping, as well as plenty of hurt feelings could have derailed the show. Luckily, Hart of Dixie is more deftly woven than its previews might indicate, and Season 2 has managed to play off Season 1’s epic ending, moving a few chess pieces around in prominent places and forcing many of its characters to take a more grown-up turn. At the heart of this is Jaime King’s Lemon Breeland, who brings attitude and charm to the table, but whose character development between last spring and this fall has helped the show to move forward as a whole. Sure, Hart of Dixie’s a delightful small town story that relies on its romance more than Rachel Bilson’s Zoe Hart’s predicaments as a doctor, but those set-ups and heartbreaks are what has always been the most satisfying part of the show. If romance and pop culture references aren’t your cup of tea, Dixie may not be a show for you, but the show knows exactly what it is, and if you gave up or have not given the show a chance, Season 2 has been better than the show’s first, and one of the better sophomore efforts this fall. 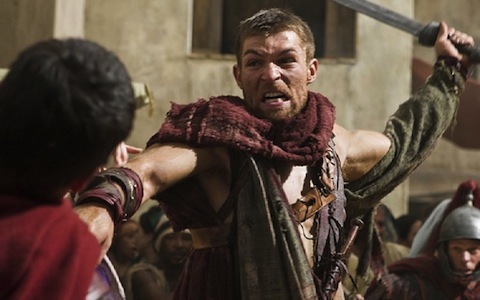 After a prequel season to fill the space between Blood and Sand and the series' return, Spartacus was back with a Vengeance this year, picking up where the first season left off, with Liam McIntyre stepping in to take over the titled role. Celebrating the return of some of our favorite characters was short-lived as the writers eventually killed a number of them off in spectacular fashion. But the bloodbath that was Spartacus: Vengeance's season finale isn't the only reason the Starz series makes the list for Best Dramas in 2012. As anticipated from Blood and Sand's finale, Vengeance took the story away from the arena and began a successful transition from gladiator-fighting show to the start of a rebellion of slaves against the Romans. And then they killed everyone off. Well, not everyone, but a lot of the main characters were given some gloriously violent and disturbing send-offs as Vengeance wrapped up, reminding us of just how high the stakes are in a series like this. It's difficult to picture the series without many of the characters who were lost this year, but their exits, (spoiler alert!) which include one character swallowing a sword, another being subjected to a forced caesarean section, and another tipping backwards over the cliff while clutching a baby, are surely burned into our minds. Vengeance took Spartacus to the next level, setting the series up for the upcoming final season and delivering some of the most exciting, suspenseful, bloody and action packed drama on television. 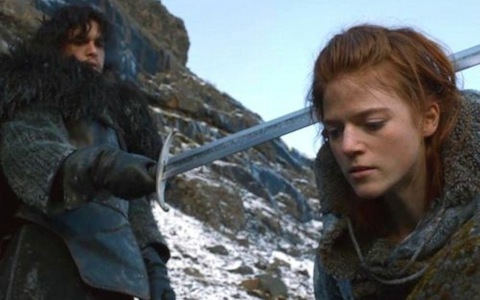 Game of Thrones came to television with a couple of major challenges to face: the first, proving to fans of the books that the show would live up to them, and the second was proving that high fantasy on a Tolkien scale could translate to the small screen. If the first season overcame those challenges, the second season left absolutely no doubt. In 2012 Game of Thrones became one of those shows that goes beyond its pre-determined fan base of loyal readers. It proved itself a drama of depth, with incredibly nuanced performances from a cast that is huge but talented right down to the least of the roles. The series took on epic battle, magic, betrayal and love and did it all without become trite or cheesy as a fantasy series is always in danger of doing. Somehow, in spite of the fantasy world in which it is played out, Game of Thrones provides characters that are relatable, loveable and hateable as well, which is what any drama needs to succeed. Led by the inimitable Peter Dinklage in the role of Tyrion Lannister, a character who came into his own during the 2012 season in a spectacular fashion, Game of Thrones was easily one of 2012’s best dramas. The wait for the third season and the coming of a new threat hasn’t been an easy one for any fan. 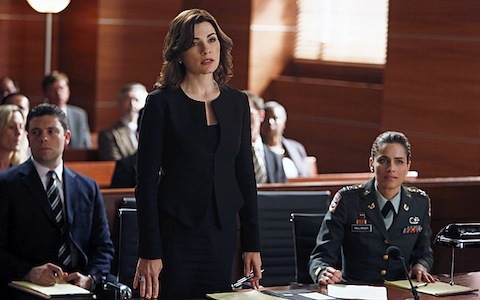 At its best, The Good Wife is a wonderful balance between the unique intrigue of a legal procedural and the overarching forward momentum of a serial drama. It lets all of its main characters cultivate rich and extensive personal lives with real consequences and still manages to show a riveting courtroom chess match between opposing litigators each week. In that way, viewer loyalty is rewarded but not necessarily required, though anyone who missed a moment of 2012 surely missed out. From Will’s disbarment to Lockhart/ Gardner’s unceremonious plunge into bankruptcy, the writers definitely didn’t play it safe this year, and more often than not, the places they took the show were riveting and mentally stimulating. The addition of Nathan Lane’s trustee Clarke Hayden was a masterstroke, offering Diane Lockhart and Will Gardner both a helping hand and a judgmental boss to answer to, and many of the guest stars including Martha Plimpton (who won an Emmy) and Jason Biggs made the most of their episodes. Best of all, the characters we’ve grown to love like Alicia, Kalinda and Will all grew richer, more vibrant and more intriguing. Things might not be blissful inside the once thriving law firm of Lockhart & Gardner, but from a viewer’s perspective, things have never been better inside this fictionalized version of Cook County. 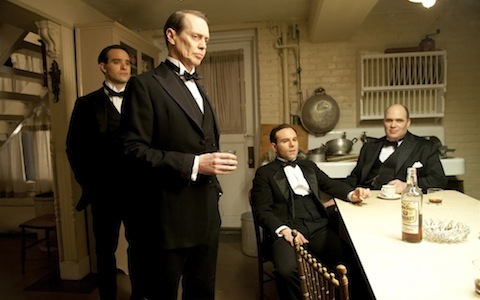 Not many returning series had as big a mountain to climb as HBO’s Boardwalk Empire. The prohibition era drama set in Atlantic City was facing said hyperbolic challenge because of the ballsy yet series shattering conclusion of the second season. The show, uh, shot itself in the face a little by murdering Michael Pitts’ Jimmy, because he wasn’t just a co-lead but a lot of the heart and, on a more perfunctory level, the storylines and characters depended on his presence. But creator Terence Winter, and his band of writers, were more than up to the task, crafting a novel of a third season that somehow both extended its sprawl, elevated the emotion and wrapped itself up, oh so tightly. And bloodily. But the third season of Boardwalk Empire was about so much more than just littering the screen with corpses, delivering a run of episodes as good as any on the small-screen this past year. It began with an explosive few installments before switching gears into (what some thought was too much of) a slow burn but the final six were undeniably engaging, emotional, shocking, and ultimately satisfying. And that’s all on top of Boardwalk Empire always delivering luscious costumes, impressive sets and stunning cinematography, not to mention the actors, both returning and new - Steve Buscemi, Kelly Macdonald, Jack Huston, Michael Shannon, Shea Whigham, Charlie Cox and Bobby Cannavale - who make an ensemble that should rival any series come awards time. If not, they could easily bribe and intimidate the judges or, if it comes to it, take them out. Check out our Top 10 Comedies of 2012 HERE.